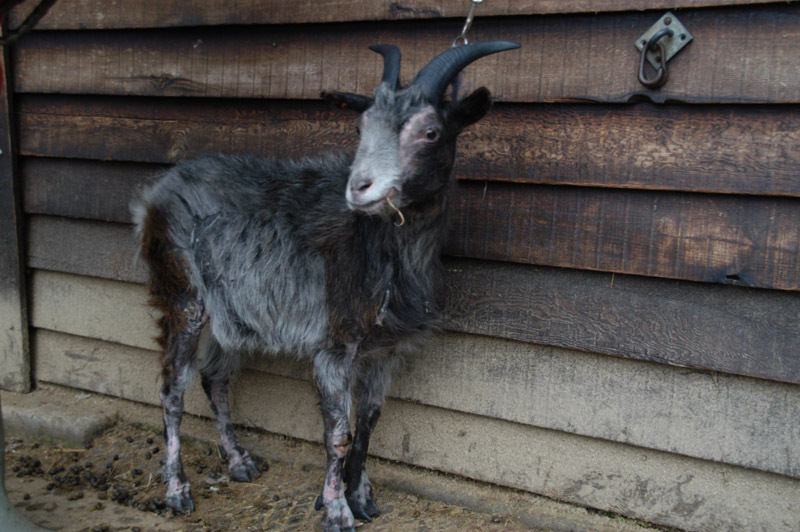 Diesel is a Pygmy goat, probably born around 1997, found abandoned by the RSPCA and brought to Buttercups in 2008. At the time of his rescue, he was in a very poor state. He was covered in engine oil and had an infected ear from a poorly fitting ear tag. He was also suffering from foot rot, an agonizing bacterial infection of the foot's horned area which causes the whole foot literally to rot away if untreated. He needed ongoing treatment over several months, and a creative approach was needed to treat his rather unusual injuries. On arrival at the sanctuary, we bathed him repeated in warm water, using detergent and bacterial shampoo to remove the oil. 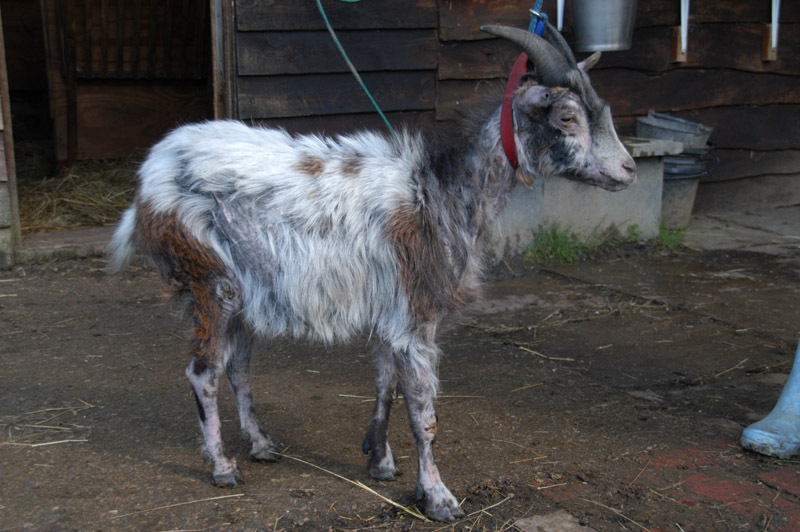 This revealed we actually had a brown and white goat, rather than the grey one we initially thought we had! Our vets checked him over and gave him medication to help with the severe breathing problems he was experiencing. Soon after this, all his hair fell out, leaving him pink skinned and almost bald. Worse, the engine oil left his skin dry, shrivelled and cracked, with numerous ulcer-type sores. This was difficult to treat - initially, we used a combination of twice-daily gentle massages with baby oil, followed by weekly shampoos with a special product for dry skin. After three weeks, some hair started to reappear and Diesel's skin lost that pink look. His treatment was then changed to concentrate on the ulcers that kept re - occurring over his body - we experimented with a cream designed for burns on horses, followed by a shampoo and steroid treatment every three days. Today Diesel appears to be fully recovered from his difficulties, he no longer has breathing problems and has a full coat of hair. He has always been friendly with people, despite having to put up with endless treatments and fussing from us. 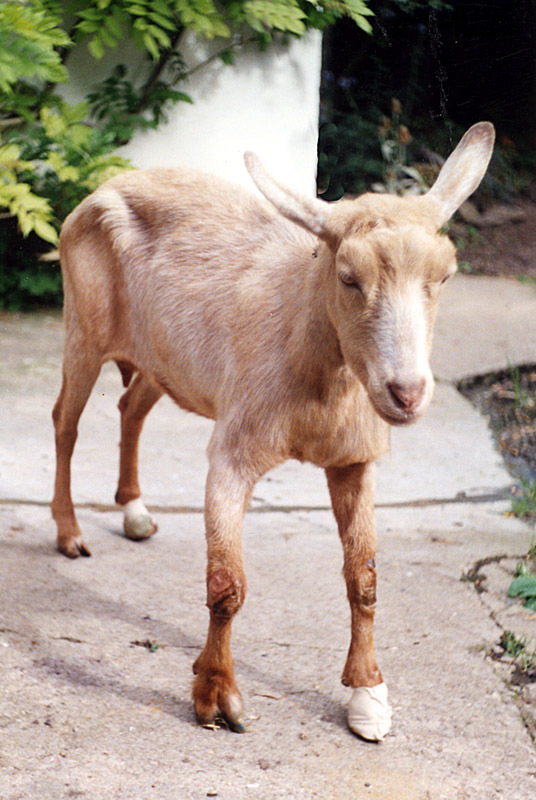 However, initially, he was very wary of the other goats, but, as his health has improved, he has overcome these nerves with resounding success and can now be seen in the thick of any activity going on, be it challenging other goats to a play-fight, or getting to the front of the queue for titbits. Lucky, formerly known as Pickles, was first rescued by the RSPCA when a month old. He was badly abused - his tail had been cut off, his throat slit, and he had been thrown in a pond, presumably to die. The RSPCA took him in, treated his wounds and found him a new home. However, this did not work out well for Lucky in the long term and he was re-rescued by the RSPCA, this time with a rub wound from an incorrectly fitting tether to his back leg. After seeing Buttercups on Countryfile, the RSPCA contacted us and asked if we could give Lucky the home he so needed, with company of his own kind. He arrived at Buttercups in March 2012. Despite the traumas he's suffered, Pickles still has a loving and trusting nature with people, although he can be a little too friendly sometimes, following them round and investigating their pockets like a small child in search of sweets. Goldie was found incarcerate in an eight by six ft. shed housed with two dozen geese. The only opening available to her was the one used by the geese, she was fed so infrequently that she slowly wasted away to a point where she could no longer stand. One day Goldie managed to crawl through the opening to the outside world. The next door neighbour saw her lying there and called the RSPCA and the police. She was taken straight to the Sanctuary's veterinary clinic where she received treatment for her over grown feet and malnutrition. 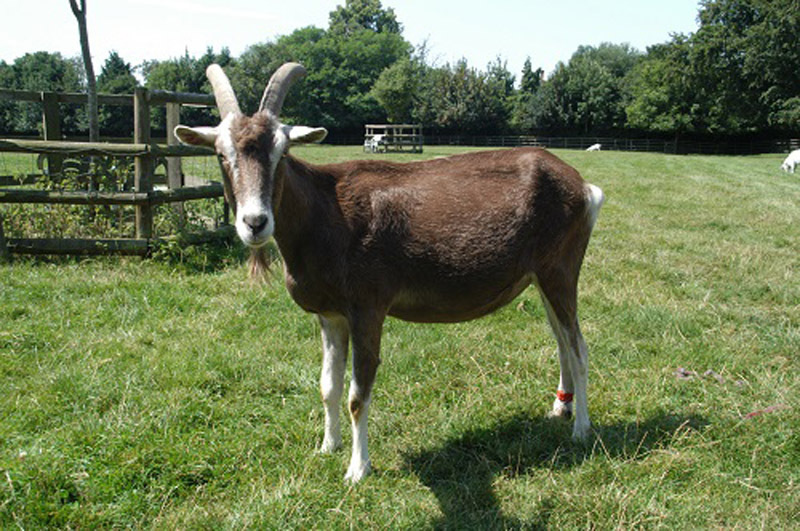 Goldie was with Buttercups Sanctuary for Goats for some years but one fine day in August after having her morning meal she strolled out into the park, laid down and passed away in the morning sunshine. Stocky and his friend were found locked in a shed with a small herd of pigs, all had been starved. When discovered they were so weak that Stocky's friend could not stand and had to be euthanased. 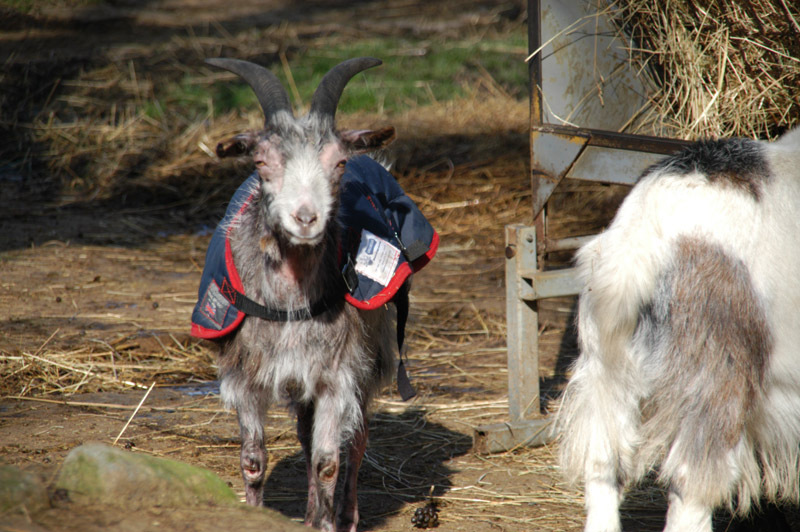 Upon arrival at Buttercups Stocky required much attention, his coat was matted with faeces, his back was bald through lice infestation and his feet were so over grown that he had difficulty in walking. 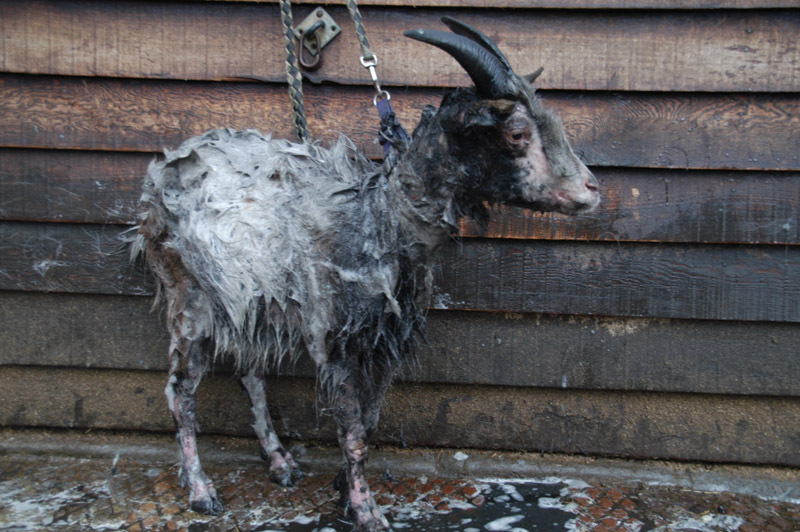 Having received urgent medical attention he was then shorn and given a nice warm bath. After recovering from his ordeal he was introduced to the main herd at the Sanctuary where he made many new friends. 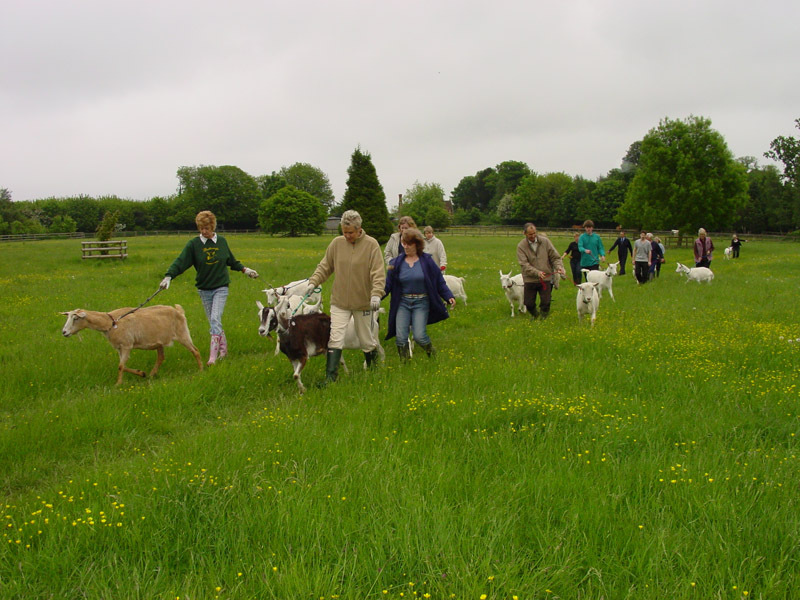 In 2008, we were asked by the Ministry of Defence to take 32 goats into care. 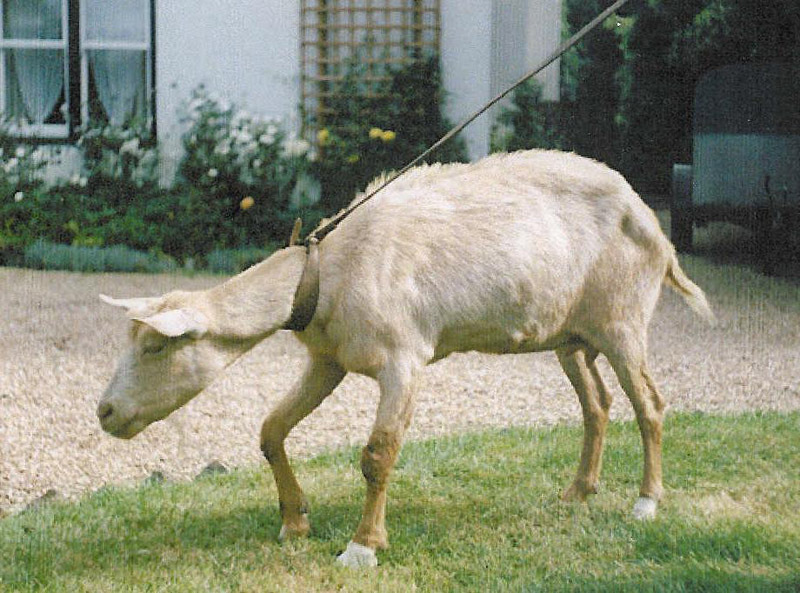 For many years the MOD had been using goats in experiments to find out how survival chances could be improved for people escaping from disabled submarines. This involved putting goats into pressure chambers and giving them the bends. 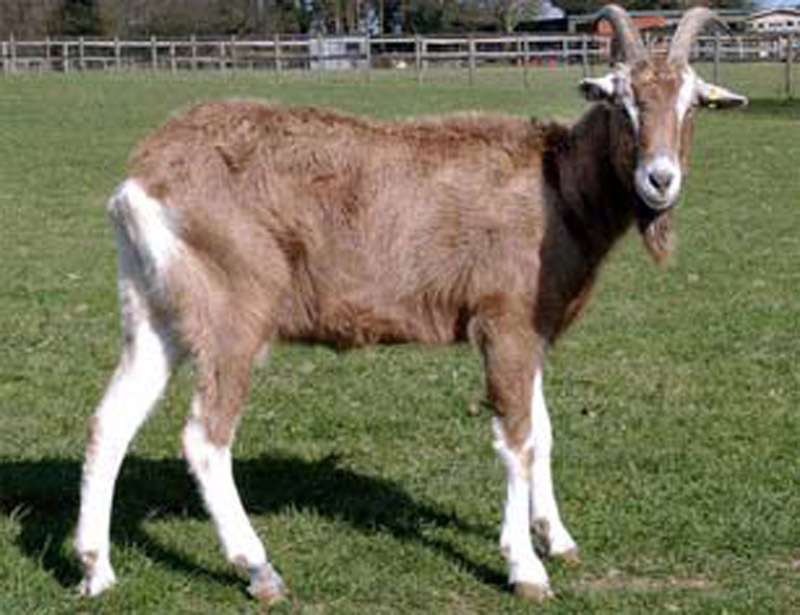 During the course of these experiments, more than 200 goats suffered and died. However, thanks to public pressure, in 2008 these experiments were halted. 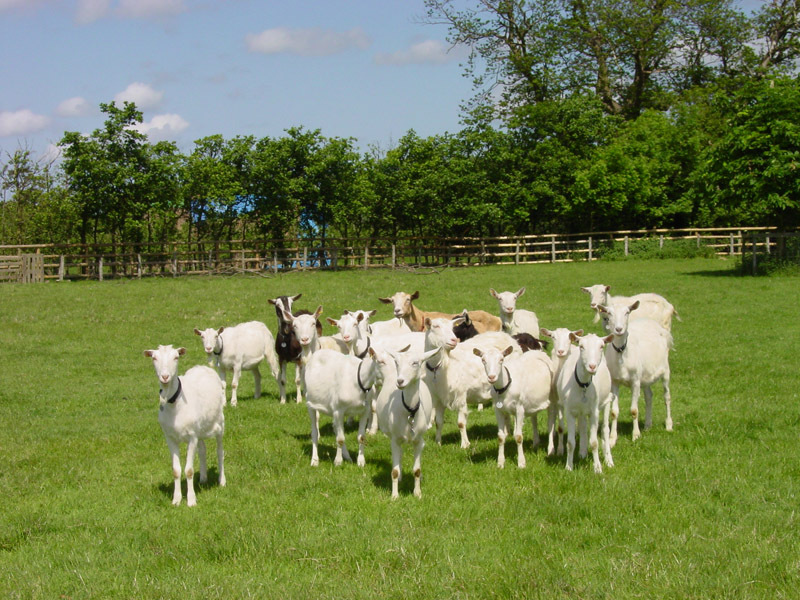 As the only charity in the UK dealing solely with the rescue of goats, Buttercups was asked to provide the MOD goats with a new home. The animals we received were healthy, had obviously been well cared for and, generally speaking, love people. They either had never taken part in the experiments or, if they had, weren't showing any adverse symptoms. 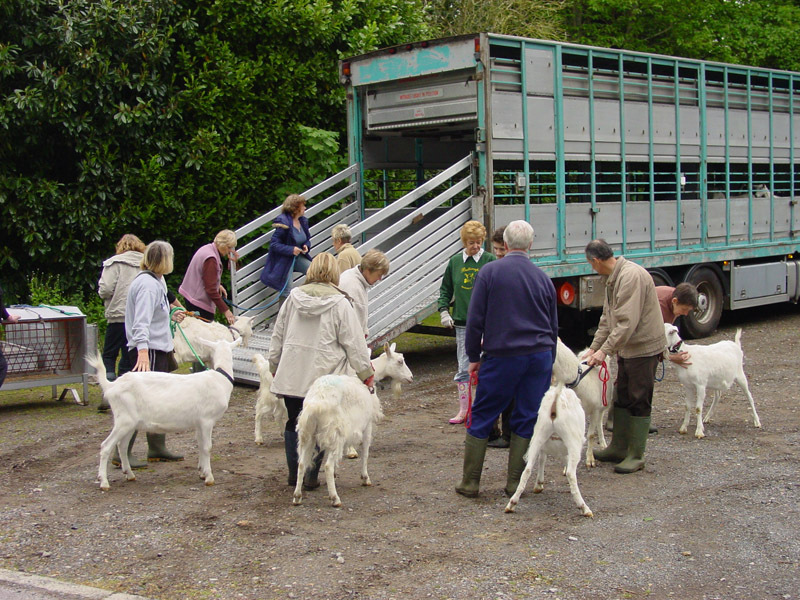 When they arrived, we welcomed the goats into the sanctuary, checked them over and gave them any care and attention they needed. After an initial period of adjustment in an area quarantined away from the main herd, we were fortunate enough to find wonderful homes for them all, and they were gradually fostered out in small family groups. Foster goats remain under the ownership of Buttercups Sanctuary, and we visit homes at least twice a year to ensure the welfare of our goats.